After 28 years we’re finally getting a 1990 Shredder, and you’re talking about Michael Bay? Why not? Heroes outsell villains. Might as well strike while it’s hot. I love the 12” bay turtles, but the size is too prohibiting for me. I collect 7” action figures. Big stuff I leave for transformers. While I will be the first to admit that the Michael Bay PRODUCED films weren't great (I feel it's important to remember this,...he did NOT direct them, therefore does not deserve all of the blame,) I will also admit that Out Of The Shadows was a much better film than the first one. Bebop and Rocksteady stole every scene that they were in, Kraang was pretty well done, and the movie was a fun one, wiping a lot of the bad after-taste that was left from the first film, which was a complete mess. That said, while I didn't care much for the "Iron Shredder" as people like to refer to him, I wouldn't say no to a NECA version of Brian Tee's Shredder from the TMNT:OOTS. I liked the sleek design and the retracting blades, and thought it was a neat look overall. I don't see NECA ever making the 2014 TMNT movie figures. There's no follow-up film planned after both films under performed at the box office, and they're too new to be considered nostalgic. Plus, I believe their response was akin to "hell no" whenever they've been asked about the modern designs. Sad. Found the reboot TMNT to be a hell of a lot better as films than most of the horror movies they made figures from... but oh well. someone will make them eventually... officially or KO. Still love my First Gokin Krang. I don't think there's any market for those figures. Outside of Bebop and Rocksteady, both films are really not good and fans and kids just didn't get into it. I don't think you'll see those designs again anywhere. We'll see. nostalgia is a weird thing. I never expected to EVER see Bucky O'Hare figures or half the crap that's making a comeback today... I'm fine with waiting. Took almost 30 years to get the 1990's figures. There is definitely a strong market for Ninja Turtles... the first movie, with people not sure what to expect, made 500mil. OotS was imho hurt by the shoddy first film. People thought it was going to be more of the same and passed. I know that's what I expected and I was shocked when I saw it. It's actually a love letter to fans of the 1987 cartoon. It's what Secret of the Ooze SHOULD have been. It is easily the 2nd best TMNT film after 1990. I can definitely see OotS getting a cult following over time like Transformers the Movie 1986, Rocky Horror, etc. Sure the second one was...better. But that was mainly due to the spot on Bebop and Rocksteady. But I don't forsee any real resurgence for these. Not with those designs, making Shredder worthless for a second time, any scene with the human cast. I don't see time being kind to those two films. Eventually it will get a reboot as Nickelodean loves to reboot the Turtles, and crush any merchandise for previous, potentially conflicting iterations. There are already some decent 2014 movie turtle figures out there. For now I want NECA to continue with the stuff we never got, like the detailed cartoon accurate turtles or the movie figures I never thought I would get. Playmates tried to do these with their Classics line and it didn't really live up to what I wanted. I'm glad NECA stepped in and started doing TMNT justice. *insert obligatory comment about scale here. In all seriousness, this is shaping up to look really good. I don't normally do figures in this scale, but I picked up the 1/4 scale Jason and was very impressed. I'll be picking this one up for sure barring some sort of sculpting disaster with the head. Hopefully we won't have to wait too long for the eventual scale down. 1:4 Scale now and no doubt 1:10 scale at either SDCC 2019 or 2020. I imagine we will get three foot soldiers and a Shredder. I just hope they tell us ahead of time if there will be a GameStop release. This was a must buy before the 1:10 line. Now I don't know if I should wait or not. Either way, this is a huge must buy in 1:10 scale. Well if they follow the pattern they have done so far, Foot soldier out nowish, Shredder out by Toyfare, SDCC 2019 or NYCC set of 3 Foot and Shredder in single box, so early 2020 before we MIGHT get Foot or Shredder in 7inch at Gamestop. I hope they make a shredder in their smaller scale as well. Dammit NECA, stop teasing us and show us the full figure already! Also, looks like the only reason we are getting both a Shredder and a Foot Soldier is because they share a lot of body parts. NECA saves a lot on tooling that way. Not a complaint tough, I'm all for it. I do fear this is why we may never see a Splinter or any other unique characters that they can't share molds with. Maybe they're doing all of the shared-parts people first so that they can make Splinter? Purely speculation on my part. 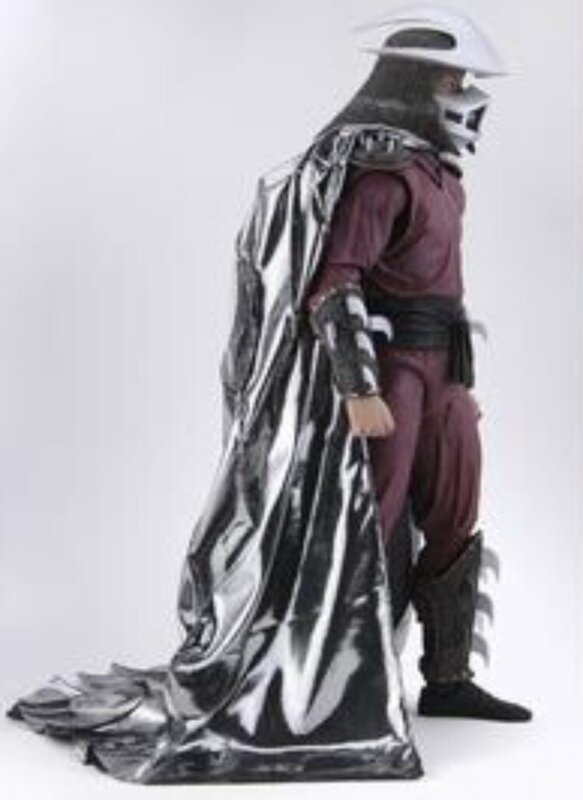 This just reminds me how weird it was that the movie Shredder had no chest armor, just ninja garb it seems. Lol I plan on getting the 7” version, so hopefully it doesn’t have a cape. I dislike fabric capes on toys. Why must they insist on teasing us like this? Also, as someone who doesn't collect figures of this scale, how do their small scale figures usually compare? Meaning how much detail is going to be lost on the smaller scale Shredder? The turtle set that was released at SDCC was excellent in translation. I can't imagine much being lost here if and when NECA decides to do it. I just hope we won't have to wait another 10 years for it to happen.